The BGA's flagship tournament - the [45th] London Open - started as usual on Friday 28th December and ran until 31st December at its new venue of the London Go Centre . 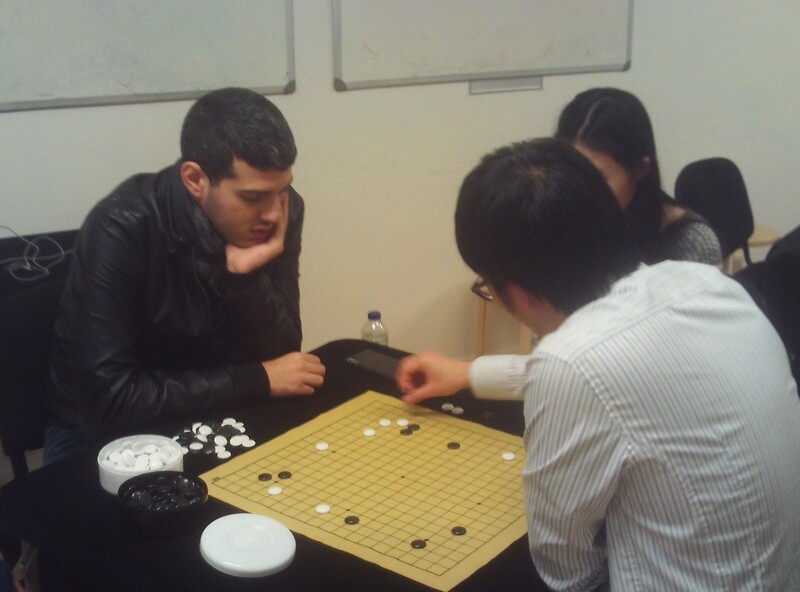 The event was limited in numbers because of it was being run at the London Go Centre for the first time and the organisers wanted to make sure things worked with a smaller venue, but still 89 players (including ghosts) took part. Next year they will be able to accept more registrations. Representing 14 countries, the players ranged from 30k to 7d, including some strong children, and there was a large party from Germany. The teaching this year was provided by European professional Ali Jabarin , from Israel, who is shown in an analysis. Also Fan Hui from France popped in for a visit. Zoe Constans from France was there sketching and selling portraits of the various players. There was the usual range of side events and a New Year's Eve meal at one of the many nearby restaurants. The first side event was the London Pair Go  on the evening of the 29th. 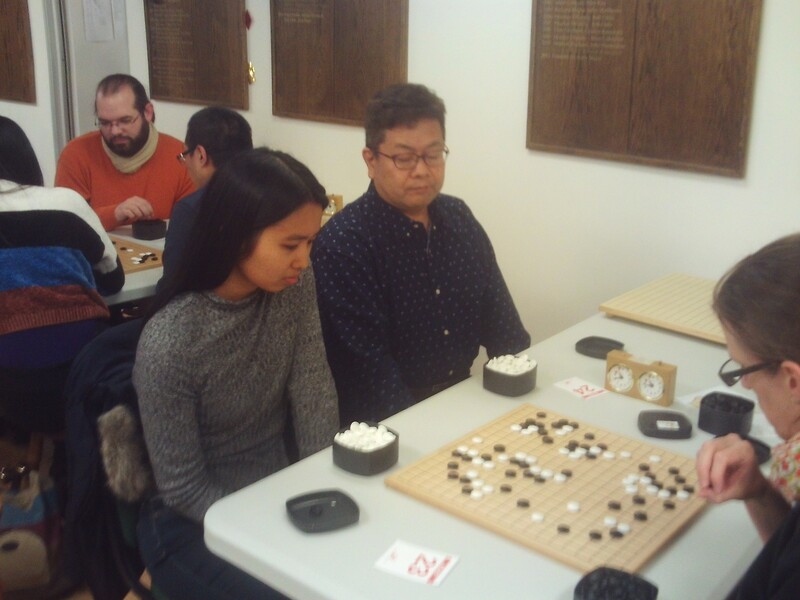 The best of the 14 pairs who enjoyed a fun but competitive event were Nagisa Mutsuura and Takeshi Mutsuura from Japan. Second were Zoe Constans and Chi-Min Oh. Results  The evening of the 30th was the Lightning . Zoe Constans proved a low-graded player could win one of the qualifying groups, but lost in the semi-finals. 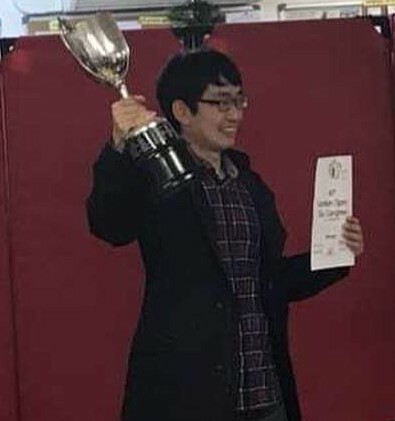 Lucas Neirynck fought hard against Chi-Min Oh in the final, but it was the 7d that triumphed in a game that ended with seconds left to go on the clocks. The final side event was that after the prize giving ceremony, namely the Rengo which was won by a team of Danes: Jannik Gram and David Sprehn were the Danes who came first and Uffe Jensen, Mikkel Mathiesen and Mathis Isaksen were the ones who came second. Players gave a big round of applause to the hard-working team who'd generously devoted 4 days of their time (plus many hours before & after the event) to organise and run the whole show. Gerry Gavigan and stalwart draw-master Jenny Rofe-Radcliffe were ably assisted by Joanne Leung and ghosts Richard Wheeldon and Tony Atkins. Last updated Mon Jan 07 2019. If you have any comments, please email the webmaster on web-master AT britgo DOT org.